NCR Forms | SG Printing Inc. When you need multicoloured copies of a document where handwritten information can be added such as order forms, packing slips, invoices, receipts etc. 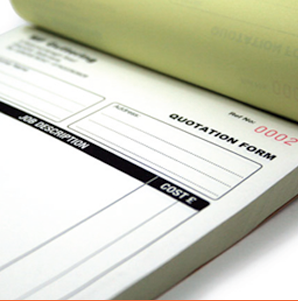 SG Printing can produce pads with two to five part NCR forms, with your details. In order to ensure your trucks and vehicles comply with Transport Canada’s maintenance and safety regulations, your trucks should undergo a regular inspection. SG Printing has the Truck Inspection Forms to protect your drivers and your business. Your clients need clear information and you want your estimates to give them a reason to choose your bid. We have the ability to provide you with the cleanest and clearest forms to help your business grow. NCR Forms are an efficient way to provide multicolored copies of a single document with handwritten. Use them as order forms, packing lists, invoices, receipts, and more. Useful where signatures, dollar amounts, or other information will be added to the form by hand. They're available in 2 Part (White, Canary) and 3 Part (White, Canary, Pink) up to 5 part forms. You have the option of choosing collated sets that are glued on any sides or you can have them perforated & padded in books with a wrap around cover.